The biennial report of the U.N. Secretary General on Small Arms and Light Weapons, issued in December, leaves little doubt about activists’ priority for 2018: to have ammunition included in the PoA, even though ammunition already has its own instrument, the harmless International Ammunition Technical Guidelines. The impracticality of focusing on a consumable commodity like ammunition, of which tens of billions of rounds are produced annually, will not deter the activists. The PoA is also likely to return to an obsession with marking and tracing modular firearms — such as the AR type of firearm popular in the U.S. — and with polymer (i.e. plastic) and 3-D printed firearms. These are, at best, niche issues, if they are issues at all. What the PoA is guaranteed not to do is to eliminate the exemption that allows China to leave its firearms unmarked in any meaningful way, thereby making them nearly impossible to trace. Getting rid of the Chinese exemption would be a genuinely useful step, but the PoA is not about doing useful things. The best the U.S. can do, therefore, is to try and ensure that the PoA does nothing at all. The U.S. certainly cannot agree to any obligation to do the impossible by tracing every bullet it produces. The ATT conference in August, fortunately, should be less fraught. The treaty is now, on its own terms, an obvious failure — nations are not paying their dues or filing required reports. The only thing left for the U.S. to do is for President Trump to ‘unsign’ it, and leave those nations that wish to keep on pretending to take it seriously to pay for their meetings on their own. But just because the ATT is accomplishing nothing useful doesn’t mean the U.N.’s efforts are having no impact on the U.S. The most disturbing thing I learned at the SHOT Show was that U.S. importers were having increasing difficulties — which they linked directly to the United Nations. One firm which relies on imports of parts from India found that New Delhi — acting under the guidance of the International Small Arms Control Standards, yet another mischievous U.N. initiative — had impounded an entire shipment worth millions of dollars, on the grounds that these parts had to be controlled under a technical definition that India did not understand and which those who did found close to meaningless. Other nations will no longer ship arms to the U.S. — even to the U.S. government. Another firm that imports firearms from southeastern Europe now has only one reliable route off the continent — from Slovenia to Austria to the German port of Hamburg. Many shipping firms departing from European ports will no longer take cargoes of arms — even when all export and transit licenses are in order — and even proper licenses do not always prevent cargoes from being seized en route. These problems began to appear after the ATT, which requires controls on the transit of arms, entered into force. Activists will no doubt celebrate these developments as victories. They should think again. As shipping by sea becomes harder, legitimate firms will be forced to turn to air freight — which offers an easier route for the unscrupulous. If southeastern Europe does not sell its firearms to the U.S., those arms will find their way to conflicts in Africa or the Middle East. And as it becomes harder to import parts and components, U.S. manufacturers will source domestically — as, indeed, they are already starting to do. I’m not entirely sure I understand this commentary by Ted, whom I’ve found to be a good researcher. If I’m not mistaken he is suggesting that the UN agreement, which apparently we’ve signed, is making it hard to import parts into America for the building of firearms. If this happens to ammunition too, it will throttle the flow to users. Okay, if this is the point, I’ve got it, and competition is always a good thing. But I’ve got to believe that in the total absence of imports for parts – whether guns or ammunition – American manufacturers would step up their game. That might in fact lead to an increase in prices too. Bottom line: you don’t have enough ammunition, right now or in the future. Neither do I. …Special Counsel Robert Mueller now asks for postponement of sentencing. Hmm … is it all beginning to unravel for you, deep stater? Hey, my wish for you is the same as I said for Andrew McCabe. I hope your arms and legs rot and fall off. Absent that, we should take you out and hang you from the nearest lamp post or oak tree. A Republican assemblyman believes you’ll feel safer if the worshiper in the next pew is carrying a concealed weapon. Ronald Dancer is sponsoring a measure that would allow churches, synagogues and mosques to select what he calls a “qualified person” to bring a concealed handgun into services. The lawmaker, whose district covers parts of Burlington, Middlesex, Monmouth and Ocean counties, points out, correctly, that places of worship are a terrorist target. But he’s way off base in his proposed solution. Dancer introduced his bill following two mass shootings at U.S. churches in the past three years: the killing of 26 people by a gunman at a church in Sutherland Springs, Texas, last November, and the slaughter of nine congregants at a black church in Charleston, S.C., in 2015. With all due respect to the NRA’s Wayne “The only thing that stops a bad guy with a gun is a good guy with a gun” LaPierre, introducing guns into our state’s (or any state’s) sacred places does not decrease the threat of bloodshed. It multiplies it. Evidence is growing that adding more firepower to an active shooting scene, with all its attendant confusion and mass hysteria, only increases the odds of innocent people being killed in a hail of bullets. In the Texas tragedy, for example, more than 40 people were shot before an armed neighbor intervened. One has to wonder what universe they live in? Did they not think it sounded strange to say that innocent people die in a “hail of bullets until an armed neighbor intervened” in the context of claiming that an armed person would cause more deaths? Their solution is never proffered, but one assumes that it’s nothing at all. Too bad for the churchgoers in New Jersey. Hey, I wonder how many people on the editorial board of the Times of Trenton Editorial Board even attend church? Hey, I was also wondering how New Jersey was coming with that problem of assassins and hit men? I’m not trying to make any connection here, mind you. In any case, we can all assume that the New Jerseyans don’t want to be saved by armed neighbors if churches are attacked. They’d rather see innocent men, women and children perish. And with that kind of attitude, attacked they will be. It’s only a matter of time. All they will be able to do is men and women cover the children with their bodies and hope they live. Hey Andrew, we know all about your involvement in the deep state, about your assistance in trafficking children, gems, money, weapons and oil. Comey, Mueller, TCF/CGI and The Council on Foreign Relations are all too visible to not know what they’re about. You thought you were hidden, didn’t you? It couldn’t happen to a better man. In hope your arms and legs rot and fall off in retirement. Source. I’m sure it’s nothing. Pay it no mind. HOUSTON, Texas (KTRK) –The Houston Police Department released new information Tuesday about the investigation into the shooting death of a kidnap victim during an FBI raid. During a news conference Tuesday, Chief Art Acevedo discussed the homicide investigation being led by his department. The chief detailed how the FBI SWAT team was at the home on Elbert Street in order to make a rescue to attempt to recover Ulises Valladares. Valladares had reportedly been kidnapped from his Conroe home. FBI agents attempted to breach a room in the back of the house where they believed the victim was being held. Chief Acevedo said the agents were using a tool to break one of the rear windows to gain entry to the house. During that attempt, the agent dropped the tool inside. The second agent made the decision to use his rifle to gain entry into the room. According to the HPD, Valladares grabbed the weapon and began pulling on it. Police say the agent, not knowing who was pulling on his weapon, feared he was going to lose control of his rifle. That agent reportedly made the decision to fire his weapon. One of the shots hit Valladares. A second shot went into the roof. The HPD says Valladares was bound in the room. When agents entered the home they immediately requested medical assistance. The victim died at the hospital. Chief Acevedo says the agents repeatedly yelled “FBI” while attempting to enter the home. Conditions in the room were described as dark since the FBI made the decision not to use lights during the rescue attempt. The fail is so thick here that it shouldn’t be necessary to outline it, but I will anyway. (1) The one breaking the window should have been wearing a lanyard to secure the tool if it was possible to lose the tool, and it was indeed possible since they conducted the raid in the dark (he could also have lost it in the yard approaching the house). (2) They conducted the raid in the dark, and apparently weren’t wearing any sort of night vision or using tactical lights. (3) The other SWAT team member shouldn’t have used his rifle as a tool to break the window. That’s not the function of a rifle. (4) The shooter shouldn’t have discharged his weapon without having positive ID. (5) Discharging the weapon was stupid anyway because the shooter didn’t have proper identification of backstop. (6) The person breaking the window shouldn’t have been part of the house clearing team and should have focused on his one job of breaking the window. He had one job. One job. He couldn’t even do that without screwing up. 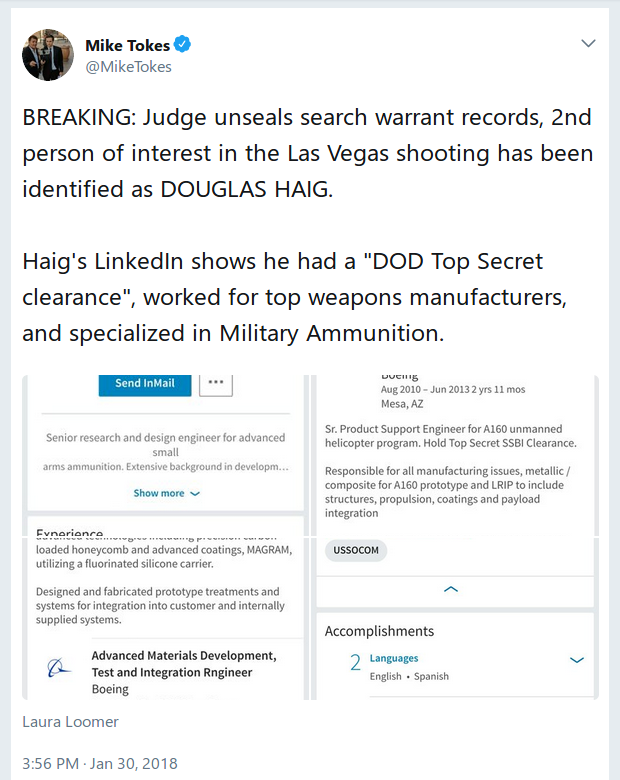 The shooter couldn’t do the job either without screwing up. (7) The FBI is a fuckup. They always have been. They shouldn’t have been doing any raid. Art Acevedo (who believes in forcible blood draws at random car stops and was driven out of the progressive city of Austin) deserves the FBI, and the FBI deserves Art. Why the FBI was involved isn’t explained, but they are both disgusting. I detest them both. Don’t do any of these things. Ever. Stay away from law enforcement, as they are the most dangerous people on the road or in neighborhoods. If you ever have to do anything at all like this, think before you do it, and use your head. David is citing from a FAS report to which we were not privy. Nice. So let’s get this straight. Because there are other precedents that infringe on our God-given rights, agreed to in the second amendment, and because a judge said it was okay, then the ATF can do it again? Okay, got it. I’ll remember this. Folks, any time you even see an ATF agent you should spit on them, or at least tell them what you think of them. They’re trash. That’s the way I see it. If you disagree, elaborate and show your work. Yet another citizen is facing criminal charges for not realizing that gun laws vary from state to state. Hayley Leach, a Colorado woman, was arrested when she attempted to check her gun in at Albany Airport for her return flight home, News 10 ABC reported. It’s reminiscent of earlier similar cases, including that of Donna Marie Gracey, the Florida woman with a concealed carry permit who was arrested last month for having it in New Jersey, or the ordeals of Shaneen Allen and others. None of them had criminal intent. I don’t fly to states where I can’t carry a gun. I don’t visit them in any way, including driving to or through them. I try not to send my money there either (Kimber, S&W, Mossberg, etc., are you listening carefully to what I’m saying?). In fact, I will not even get on board a flight where it’s possible that I’ll have a layover or exigent landing for weather or some other reason in a state where I can’t carry a firearm. By the way, you are aware, aren’t you, that the great land of gun control, New Jersey, has a sordid and wretched history with hitmen, and a not so great history of allowing people to defend themselves from such people? Guess that gun control stuff hasn’t worked out so well after all. Lizzy’s Law. It would require certain things of S.C. gun owners. “In the autumn of 2006, Elizabeth “Lizzy” Hafter, a 22-year-old graduate student, was shot twice in the head while she studied on a mountain overlook in Virginia. The man behind the trigger had stolen the murder weapon and the car he was driving from his roommate in Georgia, the first act of a multistate crime spree that left several people dead across the South. The roommate did not report the thefts to police for nearly a week, precious time lost to investigators. “He could have been stopped if the gun owner had only reported the gun and car stolen,” Hafter’s mother, Joanne, wrote in a letter to a lawmaker in the years after her daughter’s death. She is imagining that. She just made it up. She doesn’t know if anyone doing any particular thing that day could have been stopped. But the controllers want you to know they’re watching you. On the other hand, there are hearings on constitutional carry in S.C.
On Tuesday, January 30th, the South Carolina state Senate Judiciary Committee will be hearing Senate Bill 449 to enact constitutional carry. Please contact committee members today and urge them to SUPPORT this legislation. Click the “Take Action” button below to contact committee members. Sponsored by Senator Shane Martin (R-13), S. 449 would allow law-abiding adults to legally carry a firearm without first needing to obtain a Concealed Weapons Permit (CWP). Self-defense situations are difficult, if not impossible, to anticipate. Accordingly, a law-abiding adult’s right to defend themselves in such situations should not be conditioned by government-mandated time delays and taxes. The CWP will still be available for those who wish to take advantage of reciprocity agreements when traveling to other states. Okay, this is all well and good enough. But where is open carry in all of this. WHERE IS OPEN CARRY IN ALL OF THIS? Has it fallen off the radar, and if so, why? Are citizens in South Carolina letting their senators forget about open carry? Because it will piss me off if this goes yet another session without approval by the senate and house. TV host Mike Rowe likes to illustrate how attitudes have changed over the years by recalling the time he and a classmate brought a gun to his high school in Baltimore — not just any gun, but a sniper rifle. “We walked in the school, had the gun over my shoulder, walking down a crowded hall and the principal saw me and said, ‘Hey, what do you have there?’ And I handed it to him and said, ‘It’s a Mauser. Check it out. It’s an old German sniper rifle,’” Mr. Rowe said. The principal was impressed with the firearm and their plans to tinker with it in metal shop, he said. After properly and correctly observing that the culture and morals of the country have changed for the worse, Mike then proceeds to unravel his whole argument. I’ve often said that if you want to truly understand what you think the root cause of something is, pose your remedy to ameliorate the condition. Then you’ll be able to backtrack to your real problem. Not one word about evil, sin, moral choices or a country that has rejected God. Because apparently he doesn’t believe in such things. You can keep your gun-control psychiatrists, Mike. I don’t want them or need them.